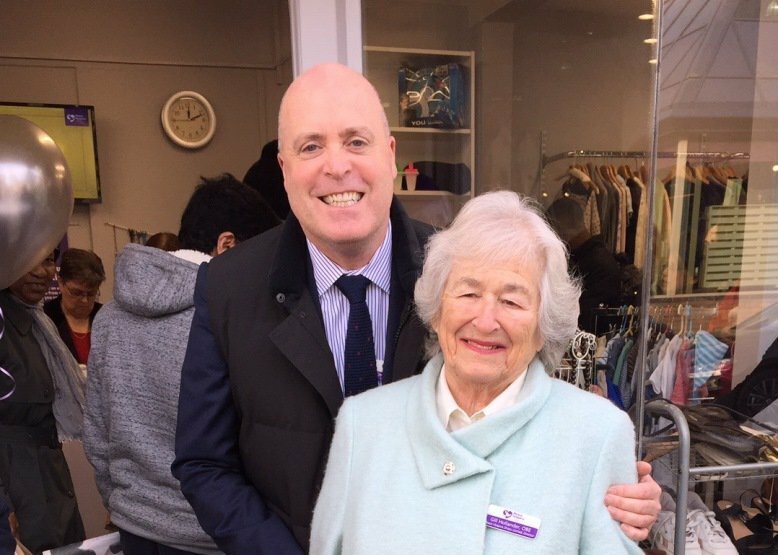 Gill Hollander OBE re-opens Peace Hospice Care’s Watford Lower High Street Shop, 27 years after opening it as the charity’s first shop in 1991. At the re-opening, Gill was joined by volunteers Elizabeth Timmons and Margaret Redding, who have dedicated a combined total of 81 years of volunteering to the charity. Gill was the first Chair of Peace Hospice Care, and in 1998, received an OBE for her part in fundraising for the establishment of the Hospice. She re-opened the Shop after it had been closed for planned refurbishment as part of the charity’s Shops’ renovations. In the first twenty minutes of re-opening, the Shop took £150 in sales, with all items selling for one pound.